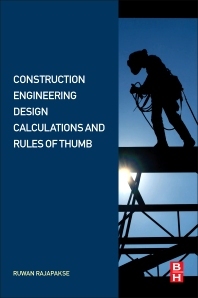 Construction Engineering Calculations and Rules of Thumb begins with a brief, but rigorous, introduction to the mathematics behind the equations that is followed by self-contained chapters concerning applications for all aspects of construction engineering. Design examples with step-by-step solutions, along with a generous amount of tables, schematics, and calculations are provided to facilitate more accurate solutions through all phases of a project, from planning, through construction and completion. Ruwan Rajapakse is presently a project manager for STV Incorporated, one of the most prominent design firms in New York City. He has extensive experience in design and construction of piles and other geotechnical engineering work. He is a licensed professional engineer (PE) in New York and New Jersey and a certified construction manager (CCM). He is currently an adjunct professor at New Jersey Institute of Technology conducting the graduate level geotechnical engineering course. He is the author of four books including Geotechnical Engineering Calculations and Rule of Thumb and Pile Design and Construction Rules of Thumb by Butterworth-Heinemann.